This time from TAG Heuer. The new Monza chronograph features blued cathedral hands and a faux enamel dial with mock aged Luminova. Somehow the case looks a bit too modern for such a heavily vintage dial. It is also reminiscent of the Longines Spirit. 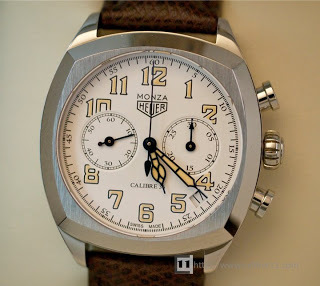 The movement is the TAG Heuer Cal. 36 which is actually a Zenith El Primero.